JVL develop and produce a wide range of versatile, high quality integrated servo motors and integrated stepper motors. The mission of JVL Industri Elektronik A/S is exclusively to help customers to build better, faster and more reliable machines. The goal is to apply the latest technology in order to develop and produce the best, most user-friendly and most economical products of the highest quality. It is our vision to be a preferred and competent partner for leading machine builders all over the world. Product Program The up-to-date development, research and production facilities of JVL employ only the latest technology for the development and production of electronic controls for step- and servo motors. More than 50% of the staff are engineers with a very high degree of experience and competence in the field of motion control. They are all highly motivated and innovative, and we can therefore offer a product programme today that includes all the necessary units and components to build up complete motor control systems. JVL first gained its high reputation in the 80�s for its development of modern, compact step-motor drivers and controllers. 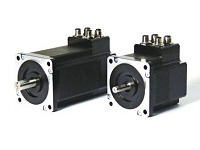 In the 90�s this successful development was followed by a series of second-to-none AC and DC servo controllers, which led to marketing of the unique integrated AC servo motor, the MAC motor, (up to 734W), and the QuickStep, integrated stepper motor (up to 2.9Nm) which both include the entire controller, encoder etc. in one compact unit. In addition to the standard product programme, JVL enjoys a high reputation for development of specialised, customised equipment. This makes it possible for our customers to solve a broad range of control tasks that cannot be directly catered for using units from the standard product range. Our expertise in such development has given us much insight into finding the optimum solution to complex control problems, and has helped many customers to find an economic, yet technically advanced solution to a complicated control application. JVL has more than 20 years of experience in motion control, and our engineers regard it as an important and exciting challenge to work together with customers and representatives to find the optimum solution to each motion control task. JVL products are marketed all over the world, in Europe, the USA and Asia, by independent representatives who are, carefully selected by JVL to have the necessary knowledge and experience, in order to help our customers in the best possible way in their choice of motion control components. Easy connection of your JVL motors to a wide range of gear boxes - worm, low cost planetary, high performance planetary and backlash free robot gear reducers. If your application is cost sensitive and you don't need high perfomance the HMGH series is the right choice. If cost is important and you also need a 90� angle - then our Worm gear boxes should be your first choice. Use the MAC141-A1AFAG which is a standard MAC 141 motor build with an 8 mm special shaft and round flange: it fits directly on the HFOS gear series. The most precise Planetary gear box we can deliver is our HAGG series from Wittenstein - better know as Alpha gear boxes. We provide them with backlash from 1 to 25 arcmin. Select them when you need the highest quality and performance, and you will get trouble-free operation for a very long time. Combine your bearing and backlash free gear box into one unit - the HSPG Spinea reducer. Unbeatable specs and perfomance made companies like KUKA and ABB prefer these reducers in their robots, which really must run perfectly 24-7. Also very suitable for turn tables, antennas, cameras, radars and e.g. tools in moulding machines. QuickStep, the Integrated Stepper Motors from JVL. A wealth of possibilities in a series of of the world�s most compact stepper motors with the higest microstepping resolution. The QuickStep series of Stepper motors with integrated electronics represents a major step forward. All the necessary electronics in a stepper system are integrated in the motor itself. The stepper motor, encoder and electronics are specially developed by JVL so that together they form a closed unit in which the power driver and controller are mounted inside the motor in a closed section. Choose MOTOR SELECTION CHART to find the motor for your application and select ACCESSORIES, CONNECTIONS, VERSIONS, and SOFTWARE below to optimize your choice for your application. Note that the driver and controller are also available a separate unit - SMC85. The electronic brake is designed to be mounted on step- and servo motors, such as the MAC 50-141 series of integrated servo motors. A high quality electro-magnetic brake is mounted inside the housing. The brake has zero backlash and no auditory noise. It fits on all step- and servo motors with NEMA23 flange and 6.35mm shaft. The brake is used when it is desired to hold the motor shaft fixed at power off, or when the motor is used in a vertical linear application. When 24 VDC is connected, the brake will be deactivated and the motor can turn freely. It is recommended to use the brake only as a holding brake and not as an emergency brake. The shaft reinforcement is designed for use with step and servo motors such as the MAC 50-141 series of integrated servo motors. It fits on all NEMA23 step- and servo motors with 6.35mm shaft. The Shaft Reinforcement contains a ball bearing with an outer diameter of 35mm and an output shaft of 14mm. This ensures that the shaft can withstand even high radial and axial loads. The output shaft and flange are compatible with Yaskawa/Omron SGM and SGMAH 200/400W flanges and makes it possible to replace existing motors with a MAC motor. Typically, absolute-encoders are used when there is a need to continue operation immediately after power is re-applied to a machine or system, without first having to perform a zero-search reset. Thereby the cost for sensor and mounting time is saved Another major reason for using absolute encoders is to correct motor position in relation to the actual physical absolute position measured. 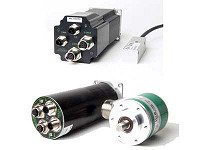 All encoders can be mounted on its own connector on the JVL motor, stepper or servo. No need for external power supply or connection boxes, because the encoder is powered via the same cable from the integrated motor. The SSI interface is used with double or triple reading to secure reading even in noisy environment. 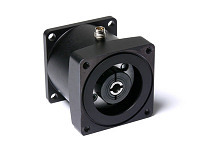 The rotational encoder can be delivered as a magnetic based low cost version with 1 degree error or a high precision optical version with 0.05 degree error. Magnetic Linear encoders have precision down to 50�m and can therefore be used for high precision application at a low cost. With it''s obvious advantages, the Magnetic measurement system is a valid alternative to traditional linear and rotative transducers. The system operates without contact and is unaffected by dirt, grease and water.